How Does Transforming Growth Factor beta Suppress Colorectal Tumor Development? Researchers review the mechanisms by which loss of transforming growth factor beta (TGFB) proteins contribute to development and progression of colorectal cancer in the January 2017 issue of Gastroenterology. Pathway members commonly mutated in colorectal cancers are in indicated in green, members affected in other GI cancers are in purple, and members that have been found altered in both are striped. Different pathway members interact, in different tissue and cell types and under different conditions. Development and progression of colorectal cancer involve loss of tumor suppressor proteins, including transforming growth factor beta (TGFB) family members. In colon epithelial cells, TGFB signaling reduces proliferation and promotes apoptosis and differentiation. Loss of TGFB signaling and its anti-proliferative effects is a feature of colorectal cancer cells and is observed in transformed intestinal epithelial cells. Cytokines in the TGFB family regulate proliferation, differentiation, adhesion, migration, and other functions in many cell types. A high percentage of colorectal tumors contain mutations that disrupt signaling via TGFB family members. Barbara Jung et al review how TGFB signaling is altered during development of colorectal cancer (see figure), models of study, interaction of pathways, and therapeutic strategies. 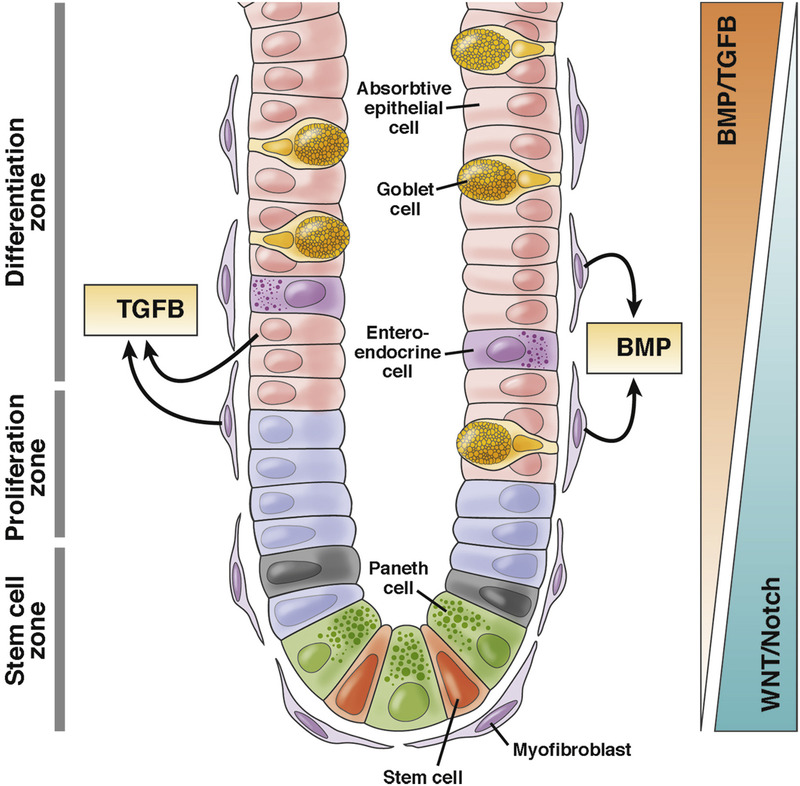 For example, Wnt and TGFB family members interact during embryonic development and in homeostasis of the adult intestinal epithelium. Jung et al describe the increasing gradient of TGFB in the colon epithelium, from the crypt to the surface, (see figure). 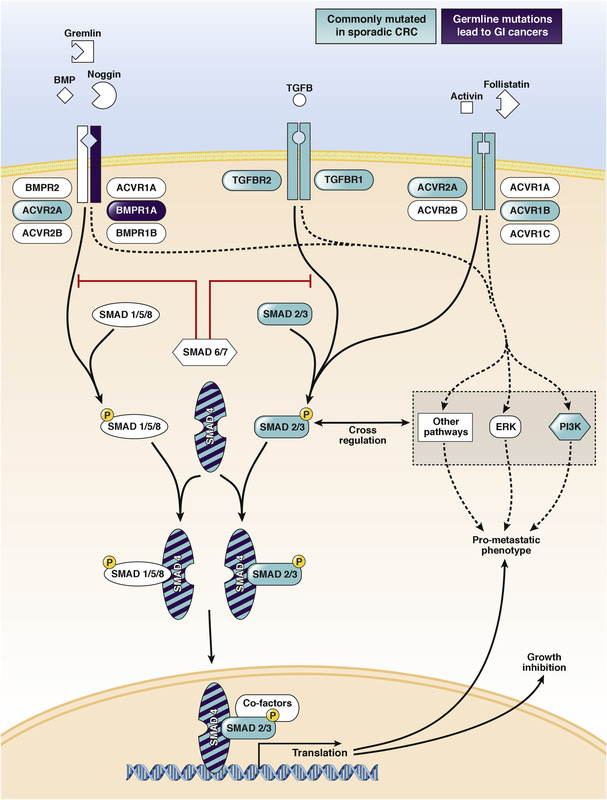 There is an inverse gradient of bone morphogenetic protein (BMPs), or Smad and Wnt, pathway activation in intestinal epithelium, indicating the interactions between these antagonistic pathways. Signaling between the epithelium and stroma by TGFB family members in normal colon mucosa. In the differentiated normal intestinal cell crypt, various gradients of TGFB family members maintain homeostasis. Although BMP appears to be secreted mostly by epithelial cells, fibroblasts are a significant source of TGFB. The authors also discuss TGFB’s anti-inflammatory effects and its contrasting roles in regulation of immune cell activities. TGFB regulates proliferation, differentiation, and functions of immune cells that include macrophages, dendritic cells, natural killer cells, B cells, and T cells. Jung et al review phenotypes of mice with disruptions in genes encoding TGFB signal pathway members, and human diseases associated with mutations in these genes. Gene expression analyses of human CRCs have provide further insights into the roles of TGFB signaling during colorectal tumor development. Jung et al discuss strategies for targeting these signaling pathways for treatment of colorectal cancers. Can a Smartphone App Monitor IBD Activity?